While Doc Savage: The Man of Bronze is missing some features that historians might argue would make him a full fledged superhero, he certainly was one of the earliest and most influential science adventurers. The absolute first superhero might be Nyctalope, who debuted in french pulps in 1911. But not many have heard of that guy. Likewise, the masked comic adventure The Clock, from 1936, isn’t particularly memorable. Those that are interested in the intricacies can lose a few hours in the Superhero fiction article at wikipedia. As for the Man of Bronze, he’s one of these primordial characters to have moved past the Golden Age of pulps and comics. Originally appearing in a Doc Savage Magazine run that started in 1933, the pulp literature character was introduced as a “peak” human. Trained from birth by a team of scientists and experts in every field, Clark Savage Jr.’s intense daily exercise regime and supreme intellect keep him at the top of his game as the perfect adventurer. Along with five other rough and tumbling experts that he met during World War I, Doc Savage travels the world, using his ingenious inventions to solve mysteries, right wrongdoings, and aid the oppressed and needy. 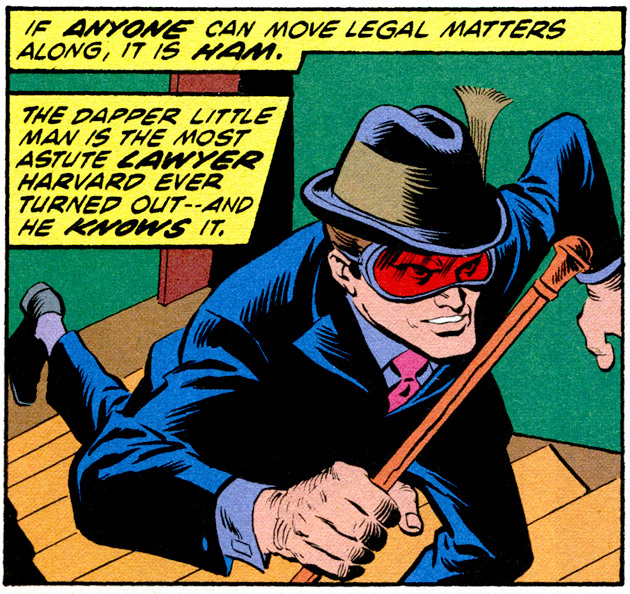 Doc was created by Lester Dent, who under various pen names (such as Kenneth Robeson) wrote some 181 Savage stories. 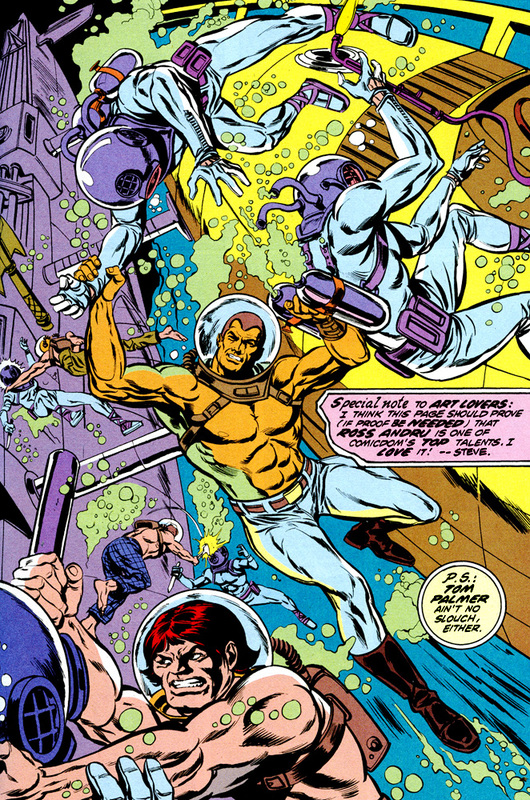 He’s seen many homages, including notable ones in Warren Ellis’ Planetary and the Alan Moore’s Tom Strong, and is still in print himself, having been included directly in DC’s 2010 First Wave title. Also published by DC this year is Doc Savage: The Man of Bronze, which actually collects a Marvel comic that ran in the early 70s. This Bronze Age title, in turn, reworked some of Lester Dent‘s earliest stories from 1933 and 1934. 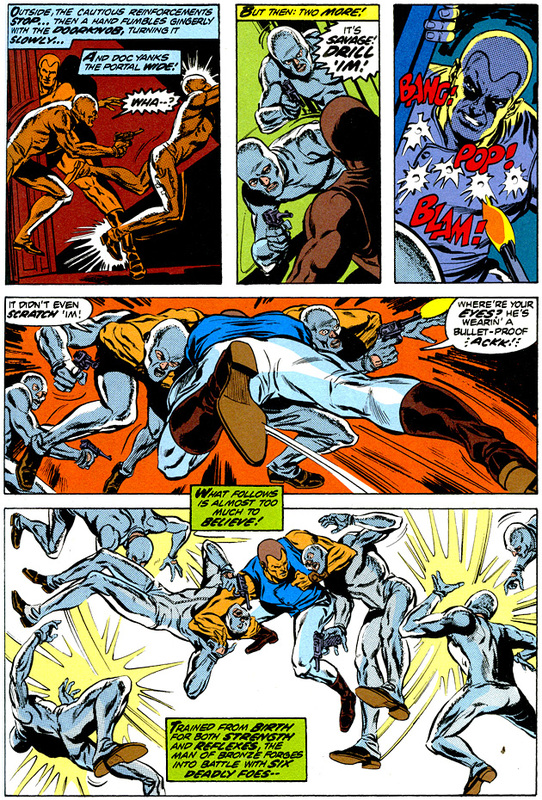 There are four stories here, The Man Of Bronze, Death in Silver, The Monsters, and Brand of the Werewolf, each taking place across two issues. 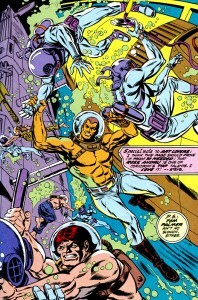 The first couple stories are adapted by Roy Thomas and Steve Englehart with Gardner Fox and Tony Isabella handling the latter two. Ross Andru does the majority of the pencils along with help by Richard Buckler. There’s a good smattering of talent here and don’t let the mix scare you. This book is very consistent, with no jarring differences between writers and artists, delivering a fun adventure story in a mix of the original pulps and Kirby influenced Marvel house style. When I first sat down with the book, the comic historian in me was very excited by the Savage name. The Jim Steranko cover didn’t hurt either. I have to admit that the first few pages were kind of jarring. Instead of a nice historical introduction, there’s a bit introducing the cast. While not badly written, sometimes such pages are a hint that the book you’re opening is overburdened by continuity. 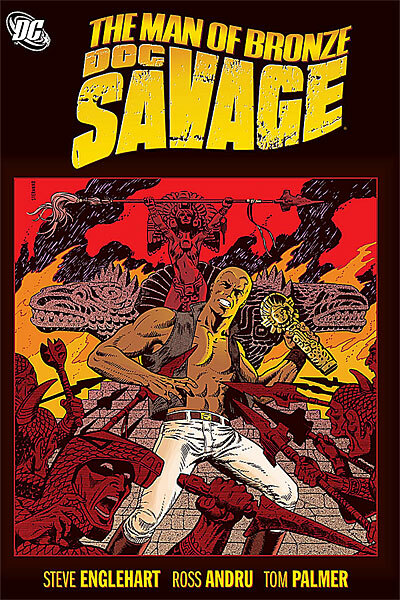 Also, the character design for Savage is really weird – perhaps accurate to the magazines, though I’ve seen some much more human looking versions – but he looks like a cross between a manhunter robot and a genie addicted to tanning beds. 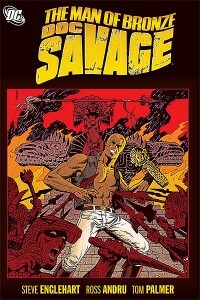 Luckily, Savage grew on me, and I needn’t have worried about the continuity. While the story seems to jump right into the action (with some very Bronze Age Marvel villain designs) it works perfectly like that. I think the book actually opens with an adaptation of the very first pulp story, so it must have worked like this right from the start. You needn’t know much more about the characters than Doc’s mastery of just about everything and kind nature, Monk’s gorilla type frame holding the brain of a genius chemist, or Ham’s role as a well dressed lawyer with a sword hidden in his cane. They’re adventurers and you get to know them by watching what they do best – adventure! I was surprised by how much I enjoyed this book. I expected it to be interesting and fun on a level similar to many older comics, getting by mainly on a sense of fauxstalgia (nostalgia for events and styles that were popular before you were born). But while many of the plots are similar to stories I’ve read before in Golden and even Modern Age comics (probably because these Savage stories were influential), I was also kept constantly on my toes. As an example, Batman aficionados might want to read The Monsters, which was originally published in April 1943 and was probably quite influential on the 1940 Batman storyline about Hugo Strange. I’d have a hard time believing that Kane and Finger were not familiar with Lester’s work, not that there’s any stealing – just some fun parallels. Creators like Gardner Fox, who were around for both stories, must have been particularly excited about this project. In fact, I’m willing to bet most of the artists and writers treated this one as revisiting a childhood treasure. Without having read the original shorts, I feel like the adaptation is faithful. Elements like slightly offensive ethnic stereotypes are still there, but alongside the good factors as well – strong female characters, for example. The dialogue is modern enough while still retaining a very pulp feel. There’s a no-apologies craziness about the whole series of events, rather explaining afterwords than ruining a surprise with unneeded build up. Characters constantly display new skills, which some how makes sense while remaining unexpected. We know these guys are badass and part of the fun is them topping past feats. Just as surprising and perhaps a little confusing, is the use of gadgetry. It seems (and the art style might be a factor here) to be much too advanced for the 30s, when these stories supposedly take place. But interestingly enough, many of the inventions (like television, advanced submarines and helicopters, rapid-fire firearms) were featured in the original stories. Never underestimate a speculative fiction author. Ross Andru illustrated this book right at what many would consider the height of his career. He had just come to Marvel from DC Comics and was working the newly launched Defenders and Marvel Team-Up, soon working as the regular artist on Amazing Spider-Man. Only a few years later he would co-create The Punisher. His work here isn’t quite as memorable as some of those other issues (and the design for Doc Savage isn’t nearly as aesthetically sleek as The Punisher and his overly broad build can see quite awkward at times) but it’s still great for the book. It’s worth talking a little bit more about how terribly ridiculous Doc looks here. Little blue vest? 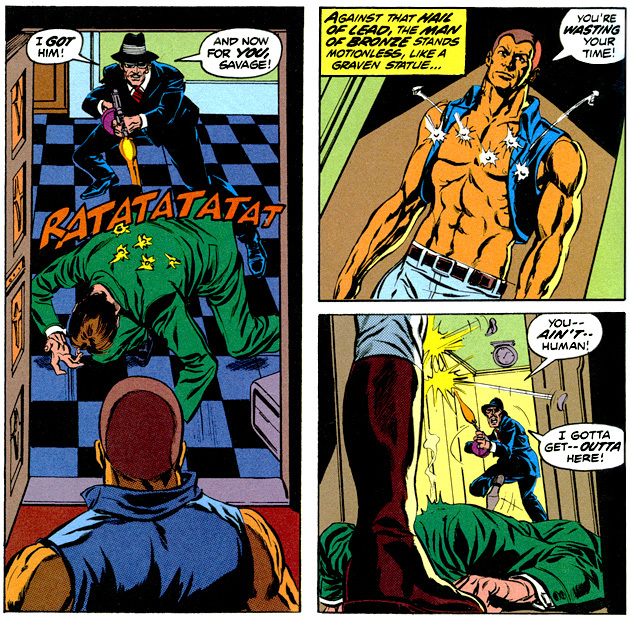 And in the last issue, a little blue furry vest? And that spray tan and widow’s peak? Not at all the Doc I always thought of from the covers of pulp paperbacks, but by the end I couldn’t help loving it, at least with a healthy dose of hipster-like irony. I’ll admit that Andru isn’t my favorite artist of this era, as I always felt his work was stuck partway between the angular intensity of Jack Kirby and the sleek musculature of artists like Neal Adams. 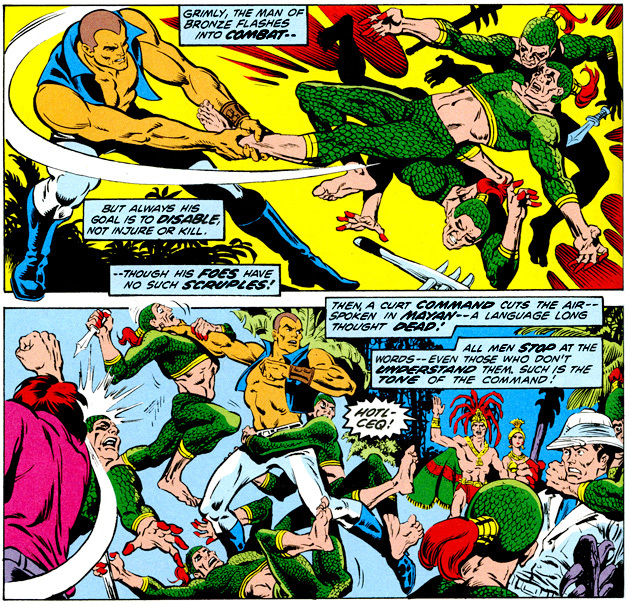 There were some times where I was reminded of Kirby more directly, mostly with the Fabulous Five that assist Savage – for some reason always conjuring memories of the Newsboy Legion and other early Kirby creations. Especially the broad face and meaty hands of Monk. Andru was an admirable craftsman, though, and his compositions flow with the action, keeping the story moving at a thrilling pace. 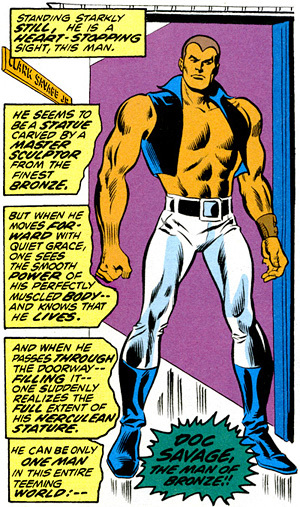 While Savage himself feels a bit too smooth at times, seeming less than human, many of the other characters have striking features. It’s especially obvious when Andru plays with the light in a scene, creating dramatic and sometimes terrible effects. I think his best work is in The Monster Men and the first issue of Brand of The Werewolf, where the more monstrous adversaries allow him to really let loose. 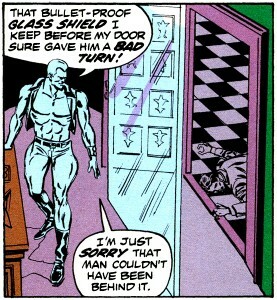 I’m not sure why the reigns had been handed to Rich Buckler for the last issue. Perhaps because Andru was working on three issues of Spider-Man, two of X-Men, and a Marvel-Team up from October to December of 1973, so he may have just been busy. 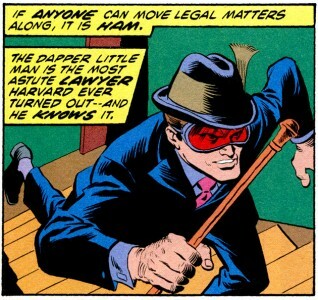 In any case, Buckler, along with Tom Palmer, who inked most of the work, and Jack Abel do a fine job with the last issue. I didn’t even notice the switchover on the first readthrough, since I was ambling along with my full attention on the action. The art here has perhaps a little bit more hatching instead of smooth lines, but it’s not particularly evident. Altogether, Doc Savage: The Man Of Bronze was a big bundle of fun. I didn’t have high hopes, since you never know what to expect with a book that’s been uncollected for so long. I wish there was a bit of a historical introduction in this volume, but I understand the more direct presentation since it’s a set of stories that can appeal to all ages of readers hoping for some quick hopping adventure. Forty years past his creation, then another forty past the adaptation, Doc Savage still stands strong. The Man of Bronze can brave danger with the best of em. Both an excellent introduction to a classic pulp hero and some fun comics that stand up to the test of time, Doc Savage: The Man Of Bronze comes highly recommended. Pick it up for the kid inside, the kid you know, or the culture historian pretending to be past childish things. Doc Savage doesn’t have a very large publishing history in comics, and his origin isn’t really as important as his adventures. I’m actually not sure if the origin story is ever told as more than a couple blurbs or mentions. But this is a good place to start. For the comics reader, you can start here. We also place it very early on our DC timeline. It’s in the 30s, right after Showcase Presents Enemy Ace, taking place in WWI. But if you are interested in the original pulps many of them (along with a lot of scholarly publication) are available on Amazon. I’m not an expert on all the various print runs, comics being more my thing, but it seems a lot has been collected past the original magazine format. 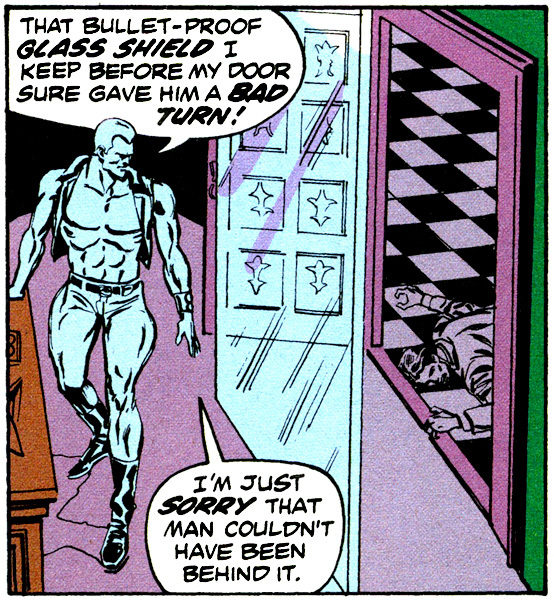 As far as trades go, Doc next shows up in Doc Savage: The Silver Pyramid, which collects the late 80s DC miniseries. There are also some contemporary trades (probably why DC published this one), Doc Savage: The Lord of Lightning and First Wave. I haven’t read any of these others yet, so I can’t guarantee they will be as high quality as this book. I personally reccomend Planetary and Tom Strong, as mentioned before in this review. Both have some examination of this kind of science adventurer, in addition to being good reads. This book also got me in the mood for some classic Kirby art action, and I might jump into the recent Newsboy Legion hardcover if I can find the time. Finally, if you’re following along on our review journey through the DC Universe Recommended Reading Order, our next book is Sandman Mystery Theatre Vol. 1: The Tarantula. « Back to the top? Doc Savage and the Brotherhood of Bronze.